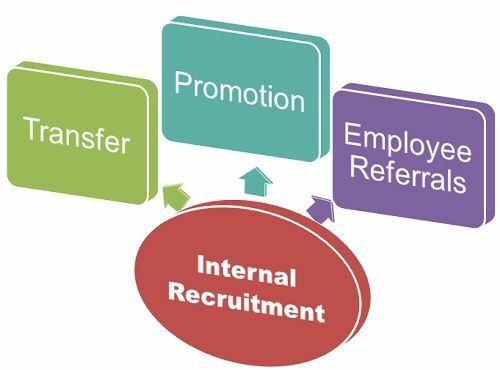 Definition: The Internal Sources of Recruitment mean hiring people from within the organization. In other words, seeking applicants for the job positions from those who are currently employed with the firm. Transfer: Transfer means shifting an employee from one job to another, typically of similar nature, without any change in his rank and responsibility. The purpose of an employee transfer is to enable him to get well-versed with the broad-based view of the organization which is essential for the promotions in future. The employee is familiar with the working of the organization. Less cost is incurred as compared to hiring the person from the external sources. The chances of selection are bright since the performance card of the individual is readily available with the firm. It boosts the morale of the employee. The others in the organization also get motivated to work harder to get promoted to the higher levels of the organization. Employee Referrals: The present employees can refer their friends and family to the job. They are well aware of the organizational culture, working conditions and job requirements. If they find their friends or family suitable for such position can recommend their names to the management for recruitment. The organizations encourage employee referrals as the cost and time could be saved than from hiring people from the external sources. Some organizations, in order to motivate employees to pay “finders fees” in the form of incentives for each successful hire. Note: The former employees are also considered as an internal source of recruitment. These are the persons who have left the job and wants to come back to work on a part-time or full-time basis.